PPP has polled the key early Republican contests of New Hampshire, Nevada, Iowa, and now South Carolina over the course of the last two months and they all have one thing in common: Mitt Romney with the lead. Romney and Sarah Palin may be closely matched in the national Republican polling right now but Romney's considerably stronger in the states that matter most. Our most recent polls have him leading by 6 in Iowa, 15 in Nevada, and 23 in New Hampshire. And today's numbers find him up by 9 in South Carolina at 27% to 18% for Palin, 12% each for Herman Cain and Newt Gingrich, 9% for Michele Bachmann, 7% for Ron Paul, 4% for Tim Pawlenty, and 2% for Jon Huntsman. Romney's formula for success in South Carolina is the same as in Iowa: dominate with the middle, lead with the center right, and avoid getting completely blown out of the water with the far right. Voters describing themselves as 'very conservative' are the largest segment of the Republican electorate in the state at 41% and Palin leads with them at 21% but Romney is at least right there at 20%. With moderates Romney leads by 26 points, getting 41% to Palin's 15%. And with 'somewhat conservative' voters Romney gets 27% to 15% each for Gingrich and Palin. Romney's looking good in South Carolina for now but one thing could change that in an instant: if Jim DeMint made a late entry into the race. DeMint is unsurprisingly far more popular with Republican voters in the state than any of the actual Presidential candidates. He would start out at 35% to 21% for Romney and 11% for Palin with no one else hitting double digits. There doesn't seem to be a serious possibility of a DeMint bid but his name pops up every couple months and he would do better in his home state than we find a lot of other folks in this field doing. 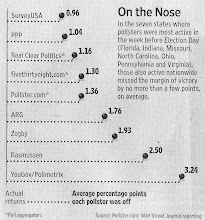 -Similar to Iowa last week Jeb Bush and Chris Christie are more popular than pretty much everyone who's actually running. If you want to look for some folks who could wait even until after Labor Day to get into it and still have a serious chance at winning the nomination those are your guys. -Three people this poll is particularly bad news for: Gingrich, Pawlenty, and Huntsman. The bad news for Gingrich has pretty much become a given. This makes 6 out of 7 Republican primary polls we've conducted in the last three weeks where he's had negative favorability numbers. Still a 36 point drop in net favorability over the last four months in a state that's pretty much must win for him is devastating. As voters are getting to know Pawlenty and Huntsman better they're liking them less. Pawlenty's favorables in the state are up by 5 points since we last polled the state but his negatives are up by 18 and he's stuck at 4% support for the nomination. It's a similar story with Huntsman- his favorable score is up just 1% since January while his negatives are up by 16. Both Huntsman and Pawlenty could make the argument that they'll poll better as they get more well known but so far greater familiarity is just breeding contempt. -Bachmann and Cain are the only candidates with any real momentum right now. Romney's polling better but it's just because Mike Huckabee decided not to run- voters aren't coming to like him any better than they did earlier this year. But Cain's favorables are up a net 15 points from January and Bachmann's are up by 10 points. The other 8 candidates who we tested on both polls are all on the decline. The big question is going to be whether Cain or Bachmann can actually translate their increasing popularity into support for the White House- liking someone is one thing while thinking they should be President is quite another. For now anyway things are looking very good for Mitt Romney. Who is "Maggie Patton" ? My cousin who lives in South Carolina. Was testing to see how someone off the street would do. No difference between her and Gary Johnson apparently! Will you poll Florida next ? The last poll you did showed Romney and Gingrich tied (with the option of Huckabee and Trump not running). I'd like to see if anything changed, because Gingrich seems to have faded slightly and Cain and Bachmann are on the rise. No head to head numbers of Obama vs Romney et al? Show me one good GOP candidate at the moment. "No head to head numbers of Obama vs Romney et al?" We always do that separately. Those are coming tomorrow. Romney is the only candidate that has me a little frightened, as a Dem. Thanks, Dustin. I didn't know you did that separately. Hmm, no hints this time?